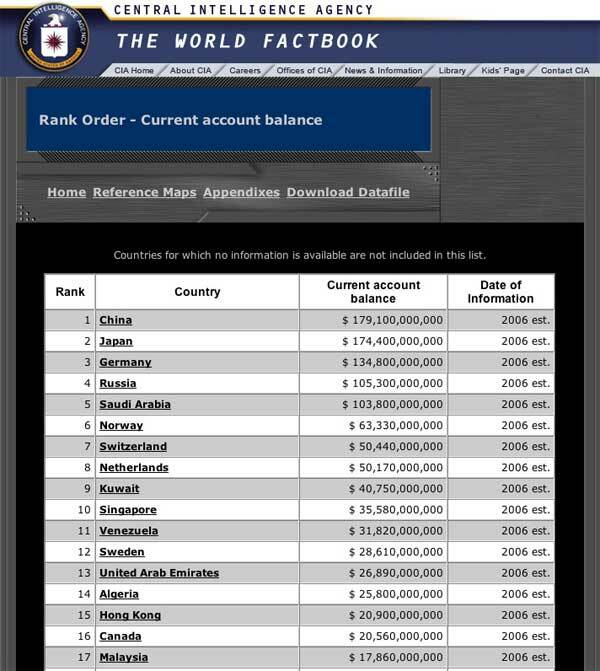 This is a screenshot from the CIA website ranking the current account balance of 163 countries. Malaysia ranks #17 while Singapore ranks #10 (with double the cash in the kitty)... and China tops the chart, closely followed by Japan! 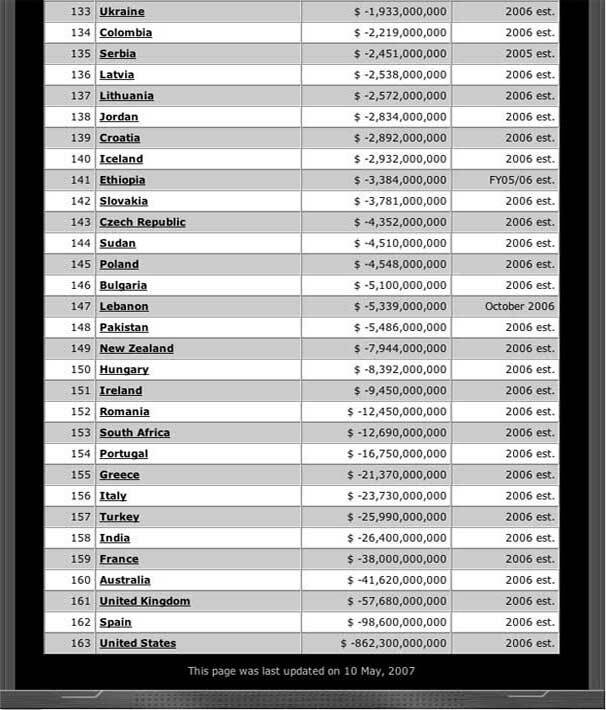 GUESS WHICH COUNTRY RANKS LOWEST WITH A DEFICIT BUDGET OF -$862,300,000,000? Click here to view original chart! I can't vouch for the CIA's intelligence, wahlau.net... but considering that the Jewish banking families, working through the Federal Reserve since 1913, have privatized 99% of America's vast wealth, this leaves absolutely nothing - minus $862,300,000,000 - in the national account! So, while individuals and private corporations may still be hoarding mind-boggling amounts of reserves in numbered and offshore accounts... in financial terms, Mr John Doe, USA, is pretty much a Dead Duck. Yes I agree. The list just shows the government's account balance, not the citizen's personal wealth. It also does not take into account current assets like property, battleships, satellites, does it? Who still has the most number of billionaires? The US, even though they're last on the list. Can the US afford to spend US$1 billion/day in Iraq? Well they don't seem to be sweating about it. Can Malaysia, even though it's 17th, afford it? No fracking way in heck. (But that will not stop people like Najib from using the list to say, "Look, rakyat! We are doing well! So who says our economy is weak? So give politicians more money! Oh, you're suffering day to day on your Kancil payments? Who cares?" Look at huge listed companies as well. Everyone knows they are doing well, but yet some of these companies have a negative bank balance (through borrowings etc). Haha, that's a funny observation about "legal" lenders like venture capitalists. Yes they do earn a lot from their clients (hence the marbled buildings and humongous expense accounts). But just to clarify (to other readers, I suppose), the banks sees Halim probably as having assets & cash flows in excess of RM800 million, even though his liabilities total RM800 million. However, the quality of life in New Zealand is still better than many countries ranked above it here. Note the number of oil, diamond and tropical hardwood producers in the top 30. Statisticans are currently agreeing on an environmental indicator other than carbon emissions as a benchmark, according to the Economist which has the least interest in such things. China will top the list for sure and the bottom fascist player will be up there too. Which just goes to show... the Economy is all a big joke, folks. You may laugh your head off. blah, all that money and nowhere to be seen. LOL. Let's all wave the flag but the usual measure of wealth are GDP and GDP per capita. The US GDP is about 100 times Malaysia's, and GDP per capita makes Malaysia the 63rd richest country in the world. Btw, the current account deficit is not the same as budget deficit either. at the finish line - no skull and crossbones for me!